Are You a Good Candidate for Dental Implants in Burlington? If you have just lost one, two, or several teeth, your next step should be to find an excellent tooth replacement option. Even better is planning for replacement before tooth loss occurs. Dental implants in Burlington offer a superior method compared to other treatments, but not everyone is an ideal candidate. It takes a healthy jaw, strong systemic well-being, and a flexible budget for implants to be the best option. 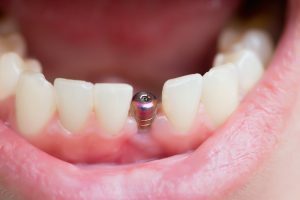 Keep reading to learn more about dental implants, including what makes someone eligible for this excellent tooth replacement. Dental implants are a comprehensive replacement option that give you back your missing tooth as well as its supportive root structure. An implant post is made out of titanium, a material that promotes the growth of bone tissue, which enables the jaw to gradually fuse with each dental implant. After a period of four to six months, the process is complete and the permanent tooth replacement can be affixed on top. A single dental implant can support a fixed dental crown, while multiple implants can retain a dental bridge or a denture. Multiple-tooth replacement options can be fixed or removable, depending on your unique needs and personal preference. Many adults are eligible candidates for dental implants. Children who have lost permanent teeth or who are lacking them from birth, however, should not receive dental implants until the jaw bone has fully formed. Placing them too early can cause problems as the jaw continues to grow and change shape. But for healthy adults, dental implants make a wonderful solution for any amount of tooth loss. Dental implants require a strong, healthy jawbone to anchor properly. You may need to have a bone graft performed first if you have been missing teeth for many months, if you have had severe gum disease, or if your jawbone is weak for any other reason. Smokers and people who have weakened immune systems as a result of certain health conditions are at a higher risk of dental implant failure. The only way to know for sure whether or not dental implants are right for you is to schedule an appointment with your dentist in Burlington. Dental implants are more expensive than non-implant-retained tooth replacement options, like dentures or a fixed bridge. Financial factors can sometimes impact a patient’s ability to get dental implants. Despite being well-known as the best option available in tooth replacement, dental implants are still often not covered by dental insurance. Considering patient financing with options like CareCredit can help you make convenient payments on the treatments you need to enjoy a clean, healthy, complete smile. Whatever the cost of dental implants, they are worth the investment — and then some. Don’t wait to find out more about this wonderful method for enjoying a stable, secure bite! Our team can’t wait to help you enjoy all the benefits of dental implants. Dr. James Kostas has been placing dental implants since 2009, and he is known as a local expert in implant dentistry. To learn more about dental implants or to discuss your candidacy for this popular tooth replacement option, please do not hesitate to contact the “dentist near me” you’re searching for. The Complete Dental Care office can be reached at 781-272-0441. Comments Off on Are You a Good Candidate for Dental Implants in Burlington?